Larry Trotter, Joe Simmons and 77 Guests are viewing this topic. In terms of evidentiary standards and general sanity levels, Mr B Doyle and Mr R Cinque are uncannily similar. The narcissism. The persecution complex. The serial misrepresentation of facts. The rewriting of history. The special pleading. The fantasies. The getting banned from one forum after another. The well-earned contempt from all serious researchers. The... loneliness. The only real difference between the two is that Mr Doyle is selling a nonsense that some LNs, in their desperation to explain Prayer Man away, are all too happy to fall for. When Prayer Man first emerged, he was obviously Mr B. Lovelady. Then he was obviously Mr B Shelley. Now he's obviously Ms S Stanton. These zealots will literally accept anyone rather than the obvious candidate------even if it means taking as their standard-bearer a man who believes there were two Oswalds in the building and that this explains what happened in those crazy first minutes after the shooting! In terms of evidentiary standards and general sanity levels, Mr B Doyle and Mr R Cinque are uncannily similar. The narcissism. The persecution complex. The serial misrepresentation of facts. The rewriting of history. The special pleading. The fantasies. The getting banned from one forum after another. The contempt with which they are viewed by all serious researchers. The... loneliness. The only real difference between the two is that Mr Doyle is selling a nonsense that some LNs, in their desperation to explain Prayer Man away, are all too happy to fall for. When Prayer Man first emerged, he was obviously Mr B. Lovelady. Then he was obviously Mr B Shelley. Now he's obviously Ms S Stanton. These zealots will literally accept anyone rather than the obvious candidate! = A TRULY HORRENDOUS YEAR FOR MR DOYLE! 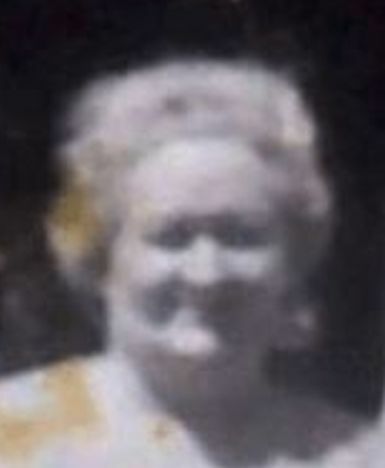 Mr. B. Doyle: "Perhaps the Intel conspirators couldn't bring themselves to murder a pregnant woman witness in Carolyn Arnold and the realization that she saw Oswald in the lunch-room was the reason they resolved the problem by agreeing on the lunch-room. That's why by the time of Truly's testimony he omits the 4th floor encounter. It's very important to note that Baker never names the individual who walked away from the 4th floor landing and the Commission never pushes him on it. I'm convinced this was the second Oswald whose witnessing created an immediate problem for Baker and Truly." This, friends, is the man who brought you the Sarah Stanton = LHO Theory! Sorry, but the buttons are there and you aren't answering it. You're not applying science because the buttons are uniform and in a row which proves they can't be random irregularities. When you have 4 all lined up where they should be you're beyond the excuses David is using and into proof. There's no way that Oswald's or any man's shirt was as low as the lowest button - which proves it is a coat and therefore it isn't Oswald. Sorry Jim but your answers show a lack of sophisticated analysis. the 4 prominent buttons seen in Darnell have to be real and have to be there because pixel blemishes could not possibly show up in perfect order right where buttons would be. This is just researchers who look at evidence in a political manner refusing to yield to the science they keep referring to but don't heel to themselves when shown. Now that I have proven that the buttons (or fasteners) are a reality and exist in Darnell's original any credible researcher analyzing this would feel behooved to answer what they show. If you look at the lowest of those fasteners you'll see that it is too low on the garment to match any clothing Lee Harvey Oswald was known to be wearing that day. Also, the spacing count of the visible fasteners is too numerous for any shirt Oswald possessed. 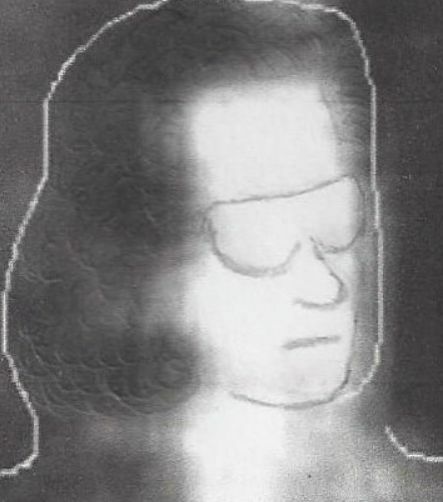 This is, unfortunately, conclusive proof that Prayer Man cannot possibly be Oswald. Once again, all this from the man who claims to have offered 'conclusive proof' that Prayer Man is Ms Sarah Stanton! I would urge all members here to ignore the paranoid psycho. "If you see this man: Do not engage in conversation, avoid contact of any kind, this man is mental"
Mr Doyle has been booted off one Jimi Hendrix fan forum after another for venting spleen and paranoia at anyone who doubts his conclusive proofs regarding the murder of Mr Hendrix. 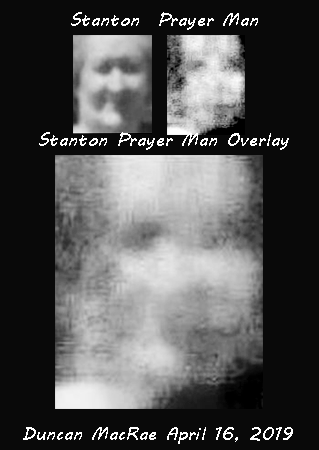 Stanton and Prayer man combined overlay with equal transparency levels. Oh dear. Yet another stake in the heart of the Stanton=PM theory!